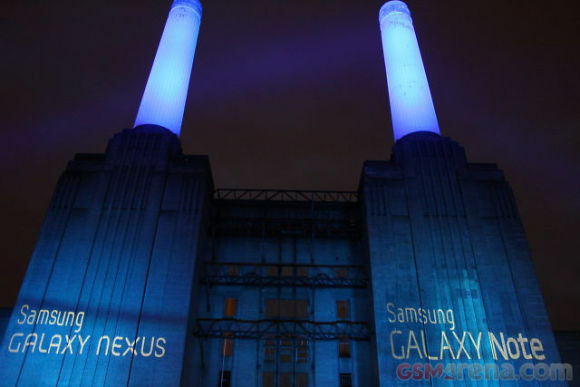 Tonight at the Battersea Powerstation in London Samsung officially announced their plans about the European roll-out of the Galaxy Note and Galaxy Nexus. The Samsung Galaxy Nexus got some air time at the event. The Samsung reps talked about ICS and the features of the Galaxy Nexus. It will begin its roll-out on November 17 in Europe and then move on to global availability. The Galaxy Note will start its roll-out from Germany on October 29 with the Netherlands, Belgium, the UK and France following in the next few days. By the end of November most of Europe should have already received the Gingerbread-running tablet-slash-phone. Samsung also announced that there will be a white version of the Galaxy Note, complete with a white S Pen. The company will also be releasing a bunch of nice accessories for the Note, including a cool-looking leather carrying case. Finally, Samsung mentioned that it will be releasing the S Pen SDK to developers in December so we should be seeing more apps that interact with the S Pen at the start of 2012. You can check out our detailed previews of the Galaxy Note, the Galaxy Nexus and Ice Cream Sandwich. Can anyone tell me when samsung galxy note will come to us. can anyone tell me when will galaxy note come to Iran? ?i am waiting for it.